February 2007 – Got Shrimp & Grits? Hey! Just wanted to let you know I’ve set up a site for 2 of my nieces in Liberia. Vicki and Kelly both contribute pictures and Vicki writes the news. I’ll be posting them on Vicki’s Site. In medium bowl, combine salsa and sour cream. Add cilantro if desired. Serve with tortilla chips. Some of you have commented on the salsa. 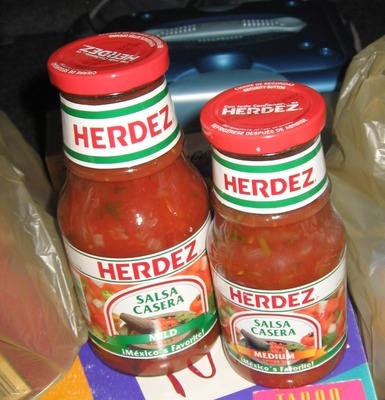 Please note that Herdez makes four kinds of salsa. Casera (translated homemade), verde (green), ranchera & taquera. I’ve never tried the ranchera version but in my opinion the verde and taquera are inedible. *shudder* I got the taquera by mistake once and said never again. It is made with tomatillos and was just not pleasing to my palate. Ok, it was downright repulsive, but obviously people like it or they wouldn’t make it. The recipe above is my favorite way of eating it. The fresh cilantro definitely is a good add-on, if you like cilantro. Let me know if you try that brand and if you like it. I think it is closer to the homemade than any other brand I’ve had, but it is a bit different than salsas made by the other companies. I do believe spring is just around the corner and from the looks of some the azalea bushes, they agree! It was a beautiful day and after a stare-down with my computer monitor for several hours this am and 30+ photo scans later, I finally won and headed out of doors. My car had a sorely needed bath and I enjoyed the sunshine and warm breeze (wind) to the fullest. I am helping to host a bridal shower next week for Roni (complicatedreamer) so I decided a shopping spree was in order to find some decor items for that. I went to a nearby town to see if they had more selection than local stores. It was fun to shop at Kroger again. You know you come from a small town when losing 2 grocery stores means you have lost 50% of the grocery shopping options (this actually happened a year point five ago). I loaded up on my favorite salsa (10 jars), which happened to be on sale at Kroger. It’s good I went through the self-check out ’cause the cashiers probably would’ve wondered what was up with this shopper. In all fairness to myself, some of the jars are for Charity. A very interesting package came in the mail today from “an admirer”. It was 2 jars of pepper jelly. Seems my PA sis actually (drum roll, please) was on xanga recently and she saw I was hunting some. She sent me 2 pints of the luscious stuff so that oughta hold me for a while!! It’s great on crackers and cream cheese! We had an enjoyable evening at Wes & Ginnys last evening. Steve & Christy (twofus_1) were here for 24-hour visit and it was good to see them again!! We even had key lime pie per Christy’s request . Wes’ parents and sister Rachel (singingrachel) and her family were here too. Hope all of y’all have a safe trip home, and as they say here, “don’t be a stranger now” which means “come again”. A big congratulations to the parents of all the new babies this past week!! So exciting and we’re happy they arrived safely and healthily. May you have sufficient energy and rest in the coming weeks! Oh yeah, salsa casera is where it’s at! 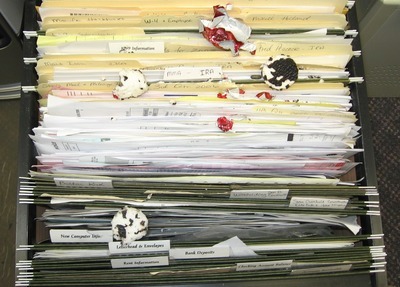 That old nasty squirrel is still getting into my office and he took care of 3 mint patties for me in one night. He obviously prefers the chocolate coating. And he doesn’t leave just the candy behind. Ugghhh! I put up a Wanted: Dead or Alive sign hoping that someone will offer to put out a rat trap and take care of it for me. May you have a rest-filled Sunday with God! an encouraging word — or so it should be. In our adult Sunday School class right now we are studying the gifts of the Spirit. Yesterday was on the gift of encouragement. Although we are not all given this gift, I think it is something we should all seek to practise. Acts of service and gifts are listed in this study as separate gifts but I think they can be used as a form of encouragement too. The latter two are definitely easier for me actively do than the words of affirmation/encouragement. I find it easier to do things for people than to verbalize how I feel about them. What are some ways that you’ve been encouraged or blessed recently by others? Do you have some suggestions of ways we can be an encouragement to others? What are some things that haven’t necessarily been done for you but would mean a lot to you?